Nine months on from the devastating fire at Grenfell Tower, with at least 71 people dead, 297 tower blocks that still remain cladded, and neither an arrest nor Public Inquiry to date, Justice4Grenfell are fighting to hold those responsible for the tragedy to account. In the first installment of our Activist of the Month feature, Hate spoke to Tasha Brade, Justice4Grenfell spokesperson. We are a community led organisation that set up in the days following the fire when we realised there was a void to be filled. There was no official capacity dealing with anything, so in the first few days we helped sort through donations and also tried to coordinate information to go out to those who needed it. Justice4Grenfell isn’t the voice of the survivors and bereaved, we fully support everything that they do and everything that they need and we’ll try and help where we can, but we want justice for what happened. We’re not going to stop, and we’re not going to go quiet. What are the aims of Justice4Grenfell? We want to create a unified community voice, we want people to be held accountable for this, and we want prosecutions. We want someone to go down for the 71 people that died in that tower and for the hundreds of people that are still homeless now, and we want people to accept the responsibility. There are 297 other clad towers in the UK, who’s responsible for those people, and why in 9 months hasn’t anything been done? Why have only three towers been de-cladded? To me that shows us how little we mean to the very people that are supposed to look after us. I think justice looks different for lots of people. 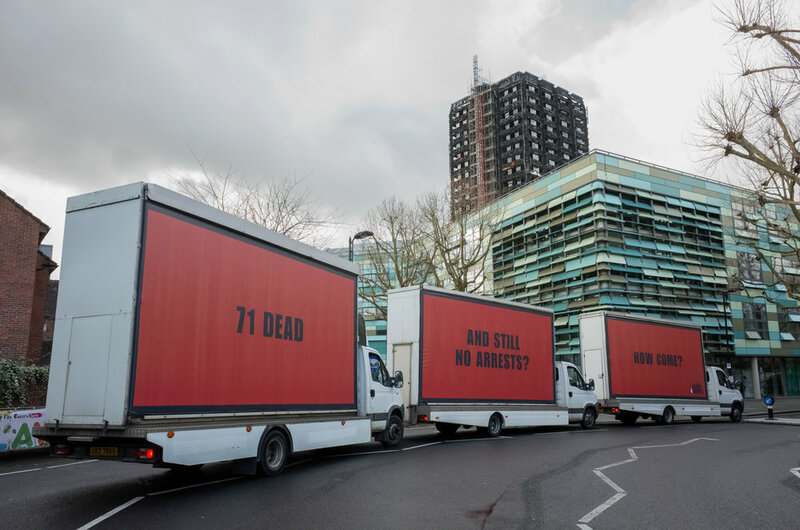 For the Justice4Grenfell campaign we want someone to be prosecuted because 71 people died. It’s affected thousands of people; we’ve got thousands of people in our community living with Post Traumatic Stress Disorder, we’ve got children who are playing in their playgrounds at school which are overshadowed by the husk of the tower that’s still there. In 9 months they’ve only covered about a third of it. People used to walk past that tower and look up and see lights on and think ‘my auntie’s home’, or ‘my best friend’s home’. Now they walk past that tower every single day and they have to look up and it just stands there as a constant reminder of that night, which can be really tricky if you’re dealing with PTSD, or depression, or if you’re still grieving. It’s a really horrible thing to see for anyone. When you see that tower everyday it’s a stark reminder of the society that we’re living in, which is a society and a system that kills, and it kills people who need the help the most, which is a pretty sad thing to realise, but it’s all about now, how do we move forward now, what do we do now? I think it should be covered quickly, but I’m also glad that it stands as a reminder to everyone that this has happened in the UK, in 2017, and it can happen again. Unless there’s action taken sooner rather than later, it will happen again. If you think about the 297 buildings covered in cladding, how many of those people worry at night that their home is going to be the next Grenfell Tower? That's really scary for me and I think it really shows the government's stance on this, that they haven’t done anything to get the other towers de-cladded. I think that’s another failure in itself. Can you tell us a bit about the Three Billboards campaign? We worked with an ad agency who came to us with this idea. We loved the film [Three Billboards Outside Ebbing, Missouri] and I think what was also important about the film was it’s a female protagonist, she’s fierce and she’s strong. The ending of the film might not necessarily coincide with what we want to achieve, but we are a group of women who are running Justice4Grenfell so it kind of struck a chord with us, and we thought if we go for this it’s engaging, it’s powerful, and people are going to take notice. We don’t want this to fall from the public eye, we’re already on page 16 of the paper or no stories at all, and there are stories within our community that still need to be told every single day, and there are so many people still suffering, so why shouldn’t we keep that in the public eye? We’re going to keep making bold, positive and affirming statements and making sure that something’s done about this, because if we don’t, who else will? That’s quite a tricky one. There’s something like 330 companies involved in the renovation and the refurbishment of Grenfell Tower, so who is responsible is a broad question. I would say the system is completely responsible. It’s a system that’s failing, it’s failing people who need help, it’s failing everyone. Everyone deserves a safe and decent place to live and raise their family, and if we can’t even offer that in one of the richest countries in the world, and the richest borough in the country, then what are we doing? What can the council and government do to help? I think they need to have a look at the fire safety regulations. I think there needs to be a discussion on sprinklers, on internal alarm systems, I think there needs to be regular checks. What’s happening now is that we’re losing building regulators and we’re losing building surveyors - I think the number dropped by thousands in the past 10 years - we don’t have those people to go out there and look at buildings. So that work is being outsourced and if we’re constantly outsourcing work then we can’t really ever hold anyone accountable for it. The government needs to say, ‘okay, this is who was in charge of that’, and then that person, or that council, or that department needs to take the reigns and make sure that tower blocks are safe for people to live in. I wouldn’t say that’s necessarily a hard thing to do. What’s really interesting as well is in the years after the refurbishment [at Grenfell Tower], I think Grenfell was visited between 12 and 16 times by people who come and check the safety, and no one picks up on the fact that the tower had flammable cladding all over it. What were they doing? I personally believe that we need a new council, we need to get this council out as soon as possible. People are so comfortable in their roles as councillors in the Royal Borough of Kensington and Chelsea council that they’ve become incompetent. The only way to build public trust would be to get rid of them and get some people who really do care and really want to make a difference. What's happening with the Public Inquiry? There were two procedural days back in December which outlined the way that the public inquiry is going to go. Then there were supposed to be two in January which were postponed to February, and then it’s been postponed now until March. It’s going to be a long run. With the public inquiry I think one of the most important things that we can talk about is the fact that Theresa May has said no to a diversely experienced panel. When we’re talking about a diverse decision making panel, we’re not talking about people of loads of different colours or loads of different races, we’re talking about people who have experience. Whether that’s social housing experience, whether that’s experience dealing with communities such as my own. We want a panel who has the same equal decision making powers as the Chair, and at the moment Theresa May said no. And I think we have Stormzy to thank for the fact that that petition - which was sat on around 30,000 [signatures] for a few months - has now reached nearly 160,000 signatures. What is important is that the survivors and the bereaved have their day in parliament and it can be debated and we can go from there, but to say no to such a simple request which is losing the trust of the very people that the inquiry is supposed to serve. When the bereaved and the survivors don’t have trust in the inquiry then they’re most likely not going to come forward and help the inquiry. Therefore you’re blocking justice at the very beginning, you’re saying ‘no, that doesn’t suit me’. So everyone loses their trust and thinks it’s going to fail and then no one wants to take part, and that’s not what the inquiry is supposed to be about. What has happened to the survivors? Right after the fire Theresa May said, ‘we’re going to rehouse everyone within three weeks’, and 9 months down the line we’ve been told it’s a year. There are still hundreds of people living in hotels, and when you think about young children, children who are learning to crawl but who are living in one hotel room with 5 other family members, we don’t think that’s fair. It’s against the law that they’ve been in emergency accommodation for such a long time. Why have people not been rehoused? I don’t know. At the time of the fire, RBKC was sitting on, I think it was around £274 million in reserves, so they have a lot of money in their bank account. I think there’s several reasons that people haven’t been rehoused, some people have been offered houses in tower blocks that never want to live in a tower block again. Some people haven’t been offered houses that they can get disabled access in. Of course it was going to be a big job rehousing every single person, but should it have taken this long? No. If they really had a truly committed team working on it 24/7 then I’m sure they could have rehoused everyone in 3 months. They decided to get people to bid against each other for new properties, so they had survivors bidding against their old neighbours for properties which in a way causes a rift if someone gets the house that you want. It’s just a really inhumane way of dealing with people. One of the suggestions that the council was given last year was to be more empathetic and remember that people have been through a lot, and people have lost their lives, and their family members, and their homes. And I don’t think the council have got that yet, I think they’re still acting in the same way that they’ve acted for many years, like, ‘oh, that’s North Kensington, so we’ll leave them out’. But actually I’d say we’re a stronger community that South Kensington, we’ve been through more and we go through more every day, every day they strip away another one of our services. In terms of Justice4Grenfell, how can the public get involved and how can we continue to keep it the public eye and show support? Every month we do a Silent Walk, so I would encourage people to come. It’s really powerful, we start at the Kensington and Chelsea Town Hall at 5:30pm on the 14th of every month and we end up back at the tower itself and at the Wall of Truth. Join our membership on our website, you can join to be an associate member it doesn’t cost a thing but we’ll update you on things that are going on. Just keep the story going, keep talking about Grenfell, if the dialogue dies then we’ll never get the truth. If we keep talking about it and we keep the pressure on to the government, to the council, to the state, if we keep that pressure going then they’ll have no choice but to listen to us and listen to our voices. Keep pushing the message out, 71 people minimum died in that tower and we can’t let them die in vain, we can’t let their story be forgotten. This petition was set up by the bereaved and survivors of Grenfell Tower so it’s an important one. If you want to do something for them at this point, I think that’s what you should be doing. Get your MPs to be at that debate in parliament when our petition has its day. Write to your MPs, contact them, and tell them to get behind it because there are going be people who will try and push it down. It’s really, really important that you keep sharing, keep signing and that you go and speak to the very people that have the power to change what’s going on. People can galvanise between their own communities, and mobilise and create a tidal wave and say, ‘no, this is what matters to us in our own communities and we’re in solidarity with the Grenfell community, and this is what we want’. There is power in people and there is power in communities and there is power in petitions and I think it’s really important if people do want to get involved, have a look at our Twitter page, follow some of the other Twitter pages that are around as well and see what they’re doing and see what they need. Just keep it going because it’s going to be a long fight, Hillsborough was years and years and years before they got any form of justice. I’m not prepared to wait that long. So we need to start moving and start getting together and really remembering it’s not just a fight for Grenfell, it’s a fight for every single person that lives in social housing, every single person that privately rents and their landlords won’t check their fire safety regulations in the building, it’s a fight for everyone in this country, because no one should have to burn to death in their own home. No one, after their homes have been burned should have to sleep on the floor of a sports centre for 10 days waiting for a hotel. No child should have to be in a hotel for 9 months. Words Luisa Le Voguer. Video Will Pine.